Hello friends and fans of Tristania! We are very happy to announce that Gyri Losnegaard has joined the ranks of Tristania, as a permanent member! It was never a hard decision to ask her to get on board. We quickly got to know her as a hard working, talented guitarplayer, skilled songwriter/lyricist, and most of all an easy going, loving person, that fit straight in the family from day one! Please give her a warm welcome! Two years ago, in August 2007, I met this very cool girl from Sardinia at Wacken Open Air in Germany. We quickly connected and ended up hanging out for the rest of the festival. She told me she was going to Norway in a couple of weeks to audition for a band, and for my part there was no surprise when only a few weeks later, Mariangela announced that she was assigned as the new singer of Tristania. A year passed. After eight years of great adventures my band Octavia Sperati decided to put band activities aside. I told Mariangela, and incidentally it turned out that her band was short of a guitar player at the time. She asked me to get in touch with the guys, and so I did. 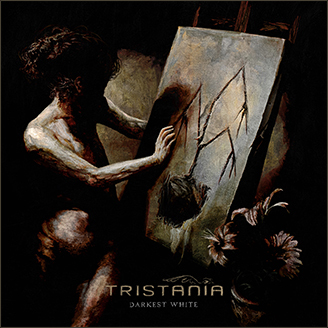 February 2009 I met with the band to rehearse for the first time, and at the end of that weekend I was welcomed into Tristania as a live guitarist. I want to thank the guys for accepting me as a band member so quickly. So far in my musical career I had only played in one other band; a band that started out, and always kept being, a project between friends. You can’t imagine how relieved I was to find that behind the name Tristania was a bunch of very, very great people. I’m probably not the most outgoing of persons, but these guys are really easy to get along with and to become fond of, and each and every one already feels like family. I was asked to join in permanently after my first two gigs with Tristania in June, and I find it a privilege to be playing with this band. I hope I will stand up to the task of being the second guitar player of Tristania. Glimpsing into the future, I see good things happening for the band. The new material is great, it is groovy, energic and a pleasure to play live. I’ve done a few more gigs with Tristania now, met some of the fans and seen their reactions to the new material, and I’m excited. I can’t wait to get out and play again and meet even more of the people who are the reason we want to keep doing this. I know there’s been a lot of changes to the band lately and that people, especially the fans, are not sure what comes next. But I’m confident that we will be given a fair chance, and that we will live up to your standards and deliver – in every way. This entry was posted in News and tagged guitarist, gyri, tristania. Bookmark the permalink.